Ever since I finished Tub #2 of my fave Origins Make A Difference Plus+ day moisturiser, I’d been on the lookout for something new to try. Yes, I could quite easily go back to it (and I plan to!) but trying new things is part of the fun, in case I stumble across a new fave. One new item I dabbled with is this, from my favourite natural/organic skincare brand. 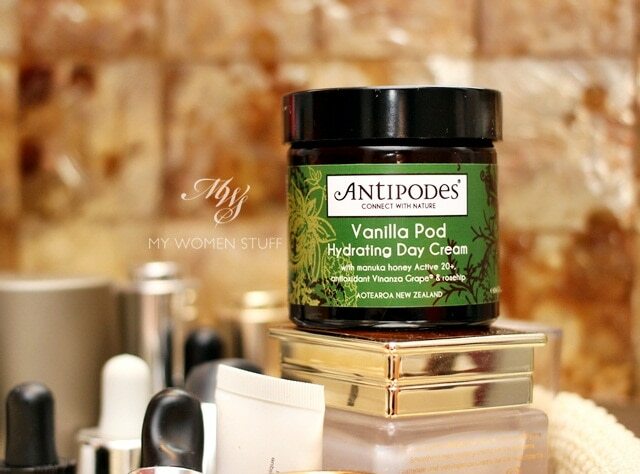 The Antipodes Vanilla Pod Hydrating Day Cream was gifted to me and came in handy just as I ran out of my day moisturiser. So far, most of the products I’ve used from the brand has sat well with me and my skin so I was curious to see if this cream would. As the name implies, the cream has a lovely scent of vanilla. It isn’t the sweet gourmand scent of vanilla cream, if you are starting to cringe at this point. I know, because I’d cringe too. In fact, I was a little worried when I opened the tub, wondering if my nose would be assaulted by the sweet smell of vanilla dessert. Fortunately, it wasn’t. This cream smells of fresh vanilla, which if you’ve smelled it, isn’t as cloyingly sweet as when found in a dessert. It smells of fresh vanilla mixed with the slightly musky scent of manuka honey and is very pleasant. However, I also realised that it did not quite sit well for me as a day cream. The texture of the cream is fairly thick, and with its hydrating properties as claimed, I’d peg this as being more suited for someone with dry skin, or someone who lives in a dry climate. If you live in a cool or cold, dry climate, you will appreciate this for use in the day. It is fairly thick, but easy to apply and absorbs quite well into the skin. However, in our humid weather, I found that even on my dryish skin, it had a tendency to feel heavy on my skin in the day. This made it feel a little uncomfortable, especially when I have sunscreen and makeup sitting on top; so I set it aside after a few days of experimentation. It just wasn’t cutting it as a day cream. However, one day, when I’d ran out of my night cream instead, I decided to give this a go. Nevermind that it says day cream on the label, I figured that a face cream was a face cream. Since it did not contain SPF, I could use it for night and I did. For use at night, the heavier texture sits longer on my skin before being absorbed, but I’m fine with that. It does not leave an oily residue, nor does it feel heavy and uncomfortable. I apply this over serums and face oils and it plays well with everything, and after a while, absorbs into my skin so the oily, heavy feeling goes away. The Antipodes Vanilla Pod Hydrating Day Cream is a nice, basic face moisturiser that does hydrate skin as promised and keep it hydrated for long hours. The cream texture does feel a little heavy and uncomfortable when used in the day time in a hot, humid climate unless you have very dry skin so I’d suggest that anyone in a hot, humid climate try this for night, as I do. It keeps my skin happy and comfortable and smells lovely of fresh vanilla blended with musky manuka honey, a scent I find comforting. I personally find that a little product goes a long way so I’m happy with this, even if I don’t use it in the day, as intended. 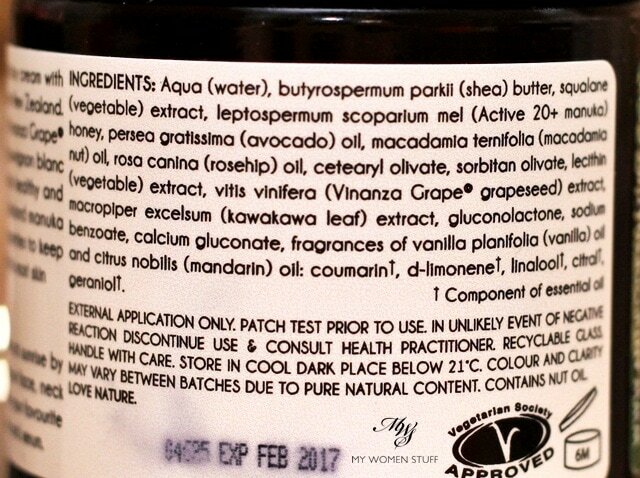 Here is the ingredient list of the Vanilla Pod Hydrating Face Cream so you can see if they sit well with you. 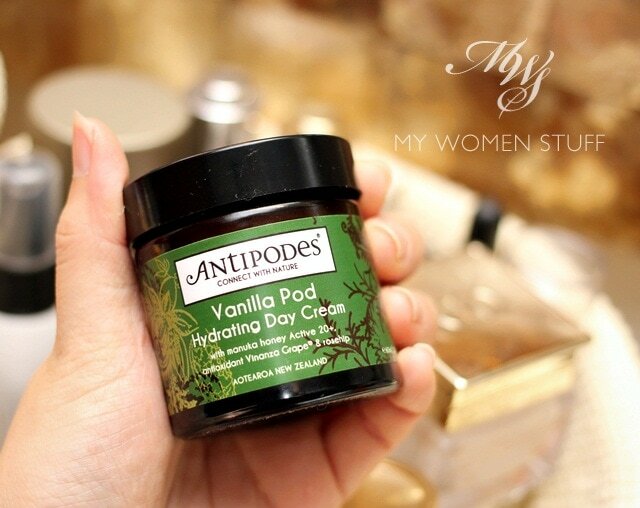 If you find the price a little daunting, I thought I’d let you know that Antipodes has 2 mini sets of skincare available for sale for a limited period, one of which contains this Vanilla Pod Hydrating Face Cream, if you’d like to try it at a smaller price tag. Locally, they retail at about RM79 each at TNS Skinlab and I can attest to them being especially great for travel. 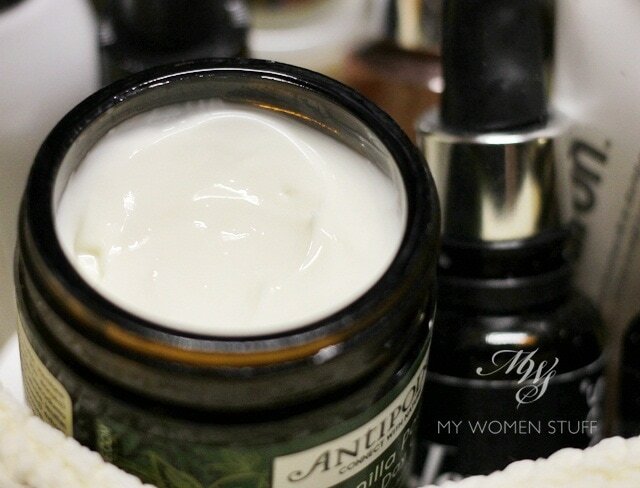 Have you tried this Vanilla Pod Hydrating Day Cream and did it work for you? Do you like vanilla scented stuff? – I spend almost my entire day during weekdays/working hours inside so get lots of exposure with full-blast air-conditioner that makes my skin so dry. – I also need to wash my skin often if I’m using makeup and sunblock because of I need to make sure my skin is free of anything that water resistant and water proof for my ablution for prayers. Yeah, it may sounds weird that even though Malaysia doesn’t have four seasons, I need two different moisturizers but I live in two different weathers depends on where I spend most of my time. Cold and dry in the office (weekdays) or Hot and high humidity (weekends). I do the same with Dr Hauschka’s Rose Day Cream in colder months. It is way too heavy as a day time moisturizer for summer or even in autumn/winter as I put on sunscreen and makeup. I’ve to say that everytime you write about Antipodes, I really want to try it! Ooh I haven’t tried Dr. Hauschka Rose cream but I remember trying their Quince cream many years ago and I loved it! You’ve just reminded me of this brand so I’m curious to go test their products again haha! Antipodes is a great brand (to me anyway) I couldn’t get organic/natural skincare to work for me till I tried this one and so far, so good! Lucky you Grace!! I read that they were on 40% off at Priceline recently and if I was there, I’d have wiped out the shelves! LOL 😀 I’ve liked almost everything I’ve tried from the brand so far, which is saying a lot, knowing how fickle I am 🙂 Do give it a shot the next time they’re on sale. I think you’d like it too! Ohh I absolutely love the avocado and rosehip face oil! I bought the mini pack when it went on sale (snagged it for $12!) I think when I run out of the face oil I’ll definitely be repurchasing it! I do agree with you that the day cream is quite thick and is best suited for night time though! Ohh! I haven’t tried the face serum yet – mostly because it doesn’t address any of my skin concerns but I’ll probably recommend it to my friend as she suffers from really dry skin. I’ll be sure to mention mixing the serum and the face oil together to her! This is definitely my favorite face cream! I’ve used it all winter as a day cream and I loved it. I really like the scent, too! Hey Paris, I checked the sets out when I saw them on your Instagram. I was also wondering if this particular cream would be too rich for daytime for my combo skin. I’m more than happy to give it a go as a night cream tho! My tube of Caudalie Vinosource moisture recovery cream is on it’s last leg! I LOVE the aura manuka honey mask fromt this range. Put it on the Belgian map and everyone is freaking out over it now hehe. Perhaps this is more suitable for wintertime when you need a barrier cream/something richer? OOh yes, I love the Aura mask too! Must schedule a review on that soon, I keep forgetting about it! And you’re definitely the King of skincare in Belgium, Phil 😉 This cream would definitely work better in the winter but since I’ve 0 chance of experiencing winter here, I’ll just have to make do! 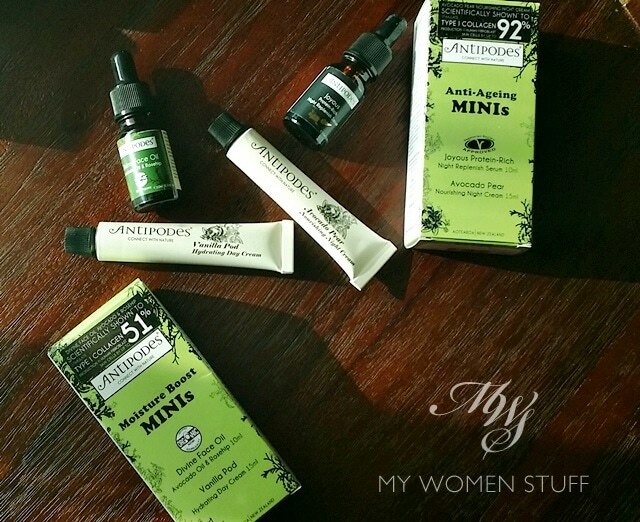 Where can I buy Antipodes products in Singapore? Thanks!! I might be wrong, but I don’t think it’s available in Singapore. You can try contacting TNS Skinlabs. I believe they ship to Singapore too.